Open iTunes and select your device in the DEVICES section on the left side. Across the top, select the Apps tab, and scroll down until you see the File Sharing section. Under the File Sharing section, select our App (us coin, gold collector, or cent collector). 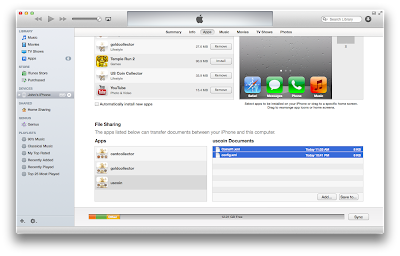 Notice in the right-hand-side, a list fills with all files the app uses. Select all these files, click "Save to..."
Select a folder on your computer and save the files. Under the File Sharing section, select the App you want to restore the collection to. In the right side, click "Add..."
Find the folder where you saved files from step #6 above. Respond Yes to prompt to replace existing files.